HostGator has been offering its services since 2002 and currently is among the best web hosting companies in the world. According to the host, it has over 400,000 clients who are provided with vps, shared, dedicated, reseller hosting. Dedicated server by HostGator is fully managed and supplied with more resources and better security. It is a cheap dedicated hosting where every plan comes with a free cPanel and can be delivered within 24 hours. Unlimited web hosting is another feature by Host Gator that may be worth the customer’s attention. It embodies 3 plans. Baby plan, along with unlimited disk space and bandwidth, is offered with unlimited number of domains. Parked domains, FTP accounts, sub domains are also have no limitations within the plan. A dedicated IP address is available for extra monthly charge. In order to purchase Baby plan at JUST ONE CENT for the first month, that comes to almost free web hosting, please use the special HostGator hosting coupon provided by PRchecker.info site. 5. Click “Continue to Step 2” button. On the open page choose the “1 Month @ 0.01” billing cycle and see the “1 cent/mo” cost lower on this page. 6. Enter other information requested, choose a payment method (either PayPal or credit card) and click “Create Account” button to complete registration. there is no place to input the code..
added in 5 min: Sorry found it. This is only valid for the first month, right? After which on subsequent month you will be charged the normal price? Yes, that’s correct. As per the article above, the special price is valid for the first month. Starting from the 2nd month the normal price is charged. The second month payment will be made automatically from my paypal account? I suppose, if you authorize Hostgator to process automatic payments from your paypal account then they should be able to do. There should be an option in your Paypal account to allow/disallow process subscriptions to exact companies.. Thanks a lot. Just registered an account. 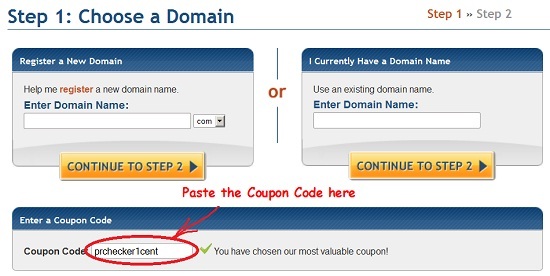 There is a new HostGator coupon that provides the very 30% off discount.